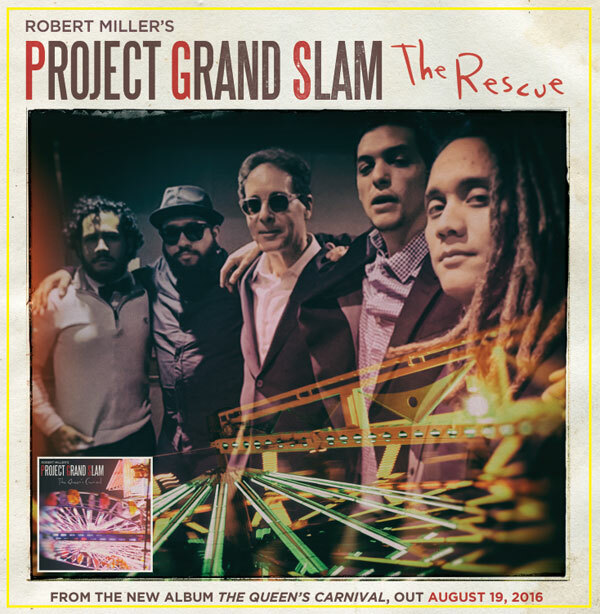 Project Grand Slam, the acclaimed jazz-rock fusion band led by bassist/composer Robert Miller, will be releasing the first single from their upcoming full-length album, “The Queen’s Carnival”, on July 1. This single, “The Rescue”, draws from a variety of influences and highlights Miller’s unique approach to blending jazz and rock into a totally new sound. While mostly instrumental, the new album features a guest appearance by vocalist Lucy Woodward on Robert’s completely reimagined cover of The Kinks’ “You Really Got Me,” and will be released on August 19 via CEN/RED Distribution, a division of Sony Music. “The Rescue” features Project Grand Slam exploring an infectious funk groove, but Miller says the song did not start off that way. “This was the final song that I wrote for the new album,” he notes. “I started off thinking about “Crossroads” by Cream, which is one of my all-time favorite live rock songs.” But as Miller and the band worked on the song it morphed into a kind of James Brown style funk meets jazz-rock fusion tune. “I’m so pleased with the way this one came out”, adds Miller. “The Rescue” has been a fixture of recent Project Grand Slam live shows and is already a proven crowd favorite. Following the successful 2015 release of their third album, “Made in New York”, which featured the hit songs “New York City Groove” and “Fire”, Robert’s highly acclaimed reimagined cover of Jimi Hendrix’s classic, Project Grand Slam returns with “The Queen’s Carnival”. This exciting and fresh take on jazz-rock fusion (Miller calls “The Queen’s Carnival” a post-fusion record) features eleven tracks, including nine original songs by Robert and both vocal and instrumental versions of the Kinks’ classic, “You Really Got Me.” This continues Project Grand Slam’s tradition of reinventing popular classic rock songs as jazz-rock fusion and featuring vocal and instrumental versions of the cover track. “I think that people can relate to covers of popular songs, and it’s very cool to try and reimagine them in a way that is both true to the original but which takes the song to a whole other level”, says Robert. Project Grand Slam — the brainchild of bassist/leader/composer Robert Miller — continues to create and perform their brand of jazz-rock fusion at the highest level. PGS’s third album, “Made In New York”, was released in September 2015 and featured two hit singles, “New York City Groove” (Robert’s love letter to his NYC home) and “Fire” (Robert’s re-imagined version of the Jimi Hendrix classic). Both singles featured 2013 “The Voice” semi-finalist Kat Robichaud on vocals. The band and Kat also filmed videos for “Groove” and “Fire” that have been viewed over 150,000 times to date. The reviews of the album and “Fire” were incredible, with words like “fantastic”, “damn fine album” and “hard to resist” for the album, and “superb”, “brilliant”, “excellent”, “stunning” and “unbelievable gem” for “Fire”. Robert originally formed Project Grand Slam in 2007. PGS’s first two celebrated albums, “Play” (2008) and “Spring Dance” (2012), had two top radio singles — “The Captain Of Her Heart” (feat. Judie Tzuke on vocals) from Play, and “Catch You Later” from Spring Dance. The band also had a featured role in the hit NBC-TV series “Lipstick Jungle” starring Brooke Shields and Kim Raver, with five of the band’s tunes featured in the soundtrack.